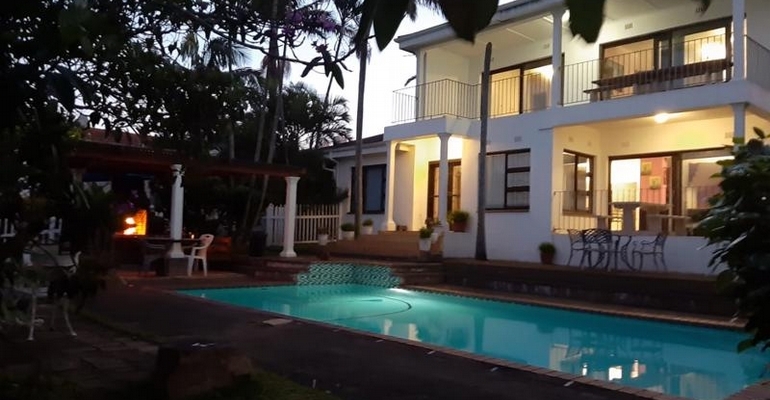 Ocean Breeze is a 3 bedroom, 8-11 sleeper, self-catering, double story house in Port Edward with 180 degree sea views. There is an outdoor bar and braai area next to a large, sparkling swimming pool. Upstairs are two bedrooms, one with en-suite bathroom (bath, shower, toilet) and a small kitchenette. Both rooms open onto the balcony which has magnificent views of the Indian Ocean. Downstairs there is one bedroom, a full bathroom (bath, shower, toilet), a modern kitchen, large open plan lounge and dining area. There is a large flat screen TV with full DSTV. Ocean Breeze is pet friendly, the manager has dogs for security reasons which are kept in an enclosed area away from the main garden. Servicing is available on request. The house is close to the banks, post office, restaurants and shops (approximately 100m walk), and the main beach is within walking distance. Across the road from the house is a grassy area which leads down to rocks which form part of the Aloe Trail. These rocks, known as Black Rock, also offer excellent fishing. Guests are also given free access to Fitness Gym, a fully equipped gym just around the corner in the post office building.